To Tom Ford, the eyebrows are one of the most important elements of the face. A perfectly groomed and shaped brow is the most powerful non-invasive way to define and enhance your features. The unique calligraphy tip allows a tailor-made stroke, from thin to wide. Remove the opposite-end cap to uncover the grooming brush; twist the cap counterclockwise to reveal the sharpener. I love the consistency of this brow pencil. It glides on very smooth and looks very natural as well. Really nice formula and easy to use. It's one of the best ones on the market. I love this sculptor...the angle that it is shaped in is pretty much fool proof .....the color pay off is just right and it is well pronounced without being overly dark. Easy to use, love the spoolie on the end! I use to blend everything together. Looks very natural. 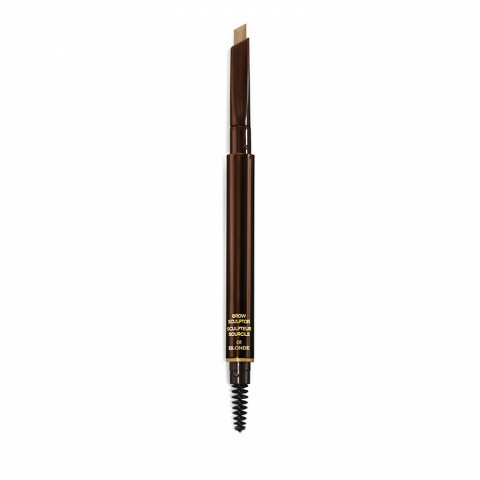 great brow product. fills in brows and gives a natural look to them. chestnut works perfectly with my coloring. built in sharpener helps to keep the pencil sharp. Fills in the brows nicely for a natural look. Great pigment and longevity.